Please note that upon confirmation of our 2011 itinerary, our selection of hotels and restaurants will be updated. Please find links below to a few of the hand selected resorts and restaurants that have been chosen for our stay in Bali, each showcasing its own unique personality and taste of Balinese culture. The Scarlet redefines the boutique hotel experience. Nestled amidst the vibrant Club Street community of creative agencies, specialty shops, boutique spas, trendy restaurants and cafes, wine bars, antiques shops and art galleries, The Scarlet provides a completely different 5-star experience. Historic Erskine Road leads you to a row of 1868 Early Shop Houses and an original 1924 Art Deco building, whose architectural detailing have been expertly retained and lovingly restored. Rooms and suites offer luxury while being wired to the world. The venues for food and drink, smack equally of a creativity that overturns perspectives. Voted one of the most romantic boutique hotels in Bali, The Watergarden offers cool thatched cottages blending natural materials and Balinese craftsmanship to create an ambience that is simple but elegant. Only eleven cool, marble-floored, thatched-roofed cottages nestle amongst the luxuriant gardens. 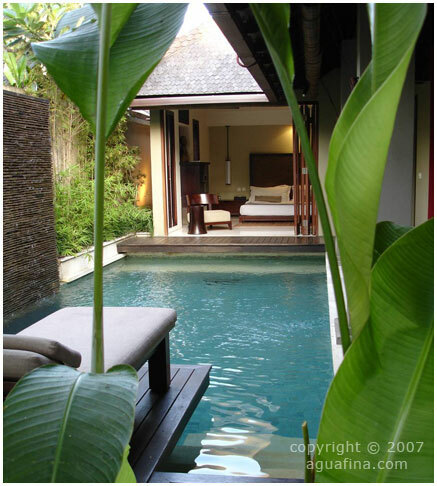 Each bungalow features a large wooden terrace built out over the water. There one can relax and enjoy the surroundings from an easy chair or whilst dining. The murmur of flowing water and the splash of leaping Koi enhance the tranquility of the lily ponds and prize-winning gardens. Here comfort, beauty and tradition combine. Found directly on a quiet surf and sunset beach in the quaint fishermen village of Canggu, the Tugu Hotel & Spa s designed to bring back to life the romantic, forgotten tales of Java and Bali. Owned by an Indonesian intellectual who has been collecting antiques since the early 1960s, the Tugu is home to one of the largest original art collections in Southeast Asia. The main building, the Bale Agung, features a distinctive architecture inspired by a secluded village in Central Bali, whereas some of the public areas are original hundreds-years-old structures moved in entirety into the property. The suites are housed in individual buildings tucked in lush tropical gardens and natural lotus pond facing the Indian Ocean. All ground floor suites (Dedari Suites) have private plunge pool and open air bathroom, whereas the second floor suites (Rejang Suites) have ocean-view and private spa area with unique sunken tub. Amanjiwo (peaceful soul) just one hour from Yogyakarta, Central Java, the cultural heartland of Java and modern Indonesia. The rich tradition and ancient culture are revealed as guests have the opportunity to experience the breathtaking nature beauty of rural Java, temples and arts that date back to the 8th and 9th centuries. Located at the base of the Menoreh Hills, in the Kedu Plain of Central Java, Amanjiwo is ten minutes from the Buddhist monument of Borobudur, the world’s largest and most beautiful Buddhist monument. Terraced down to the edge of the rice fields Amanjiwo’s suites and walkways of paras stone are rewarded with breathtaking and magical views of one of the world’s most cultural and ancient historic sites. Being a restaurant in the famed Mandai Orchid Garden, their team of chefs has created a range of cuisine where fresh orchids are used as one of the ingredients in signature dishes.. These orchid dishes have definitely introduced a new perspective on the appreciation of these flowers! The inspiration behind our starting "blue ginger" cannot be fully explained without first sharing with you aspects of peranakan culture. As a peranakan, the signature of a well-bred "Nonya", or Straits Chinese lady, was how well one could cook. It was often the matriarch of the family who would bring the entire family together, over a mouthwatering spread of spicy and aromatic dishes. In the midst of the ginger garden at the Singapore Botanic Gardens, guests can take refuge in the coolness of Halia’s air-conditioned dining room whilst enjoying views of the garden through its full-height glass windows. Extending from the dining room, a sheltered wooden deck enables sun-worshippers to bask in the sultry warmth whilst enjoying an al-fresco meal. Food is Asian inspired and deliscious. The setting is luxurious Balinese Style of open pavilions with high alang alang (thatched) roofs, surrounded by lush tropical valley views, water features and beautiful timber finishes. It has been said that CasCades is one of the world's most beautiful romantic restaurants combining an atmosphere unparallel to most fine dinning restaurants in the world. David Sosson graced The Viceroy Bali for a year with his culinary knowledge of provincial French food and spent that year training his kitchen team to be the best. He instilled into his team that fine food is based on simple exotic flavours using only the finest of fresh produce, consistency of quality at all times and visual appeal. In early June of 2000, Blair and Ben Ripple dug deep into rich volcanic soil and pulled out a handful of creamy white new potatoes. It was the first harvest for Big Tree Farms, Bali. Since those first humble beginnings on just under an eighth of an acre, Big Tree Farms has developed to become the premier producer of sustainably grown produce in Indonesia. Situated on the verdant slopes of Bali's second highest volcanic peak, Big Tree Farms' hand-carved terraces of produce flow seamlessly with the meandering contours of the jungle highland. The Firefly Supper Series offers a chance for the farmers, drivers, office employees and us to all get together and put on a delicious dinner using what we grow and present it to guests in a beautiful setting, our farm. In 2005, Firefly appeared in Gourmet magazine and the rest is history. Besides highlighting all of the Farm's produce we also wanted to support other local producers that were creating amazing culinary products all over the island. We searched Bali for eceptional locally made wine, cheese, oils, spices…some were good, some were great and others were exceptional. You will have to come and experience this for your self! The current property of the John Hardy Design Studio, acquired in 1997 as a workshop for their rapidly expanding business, was still rice fields. Concerned about converting food-producing land, the design studio also became an organic farm, complete with livestock and fish ponds. The paths are paved in river stones and lined with tall sugar cane. Rice grows in paddy fields outside the glass walls of the design center, while the food grown here is used to provides the 700 employees with a wholesome lunch. The architecture is an eclectic mix of buildings using low-impact materials such as bamboo, thatch, adobe, sun-dried brick, and the soft volcanic stone called paras quarried from nearby river gorges. A small fish pond is located between the studios functions as a water quality control: as long as the fish thrive, ensures that no pollution from the workshops is getting into the irrigation system. Relax, unwind and renew your soul in our life spa - treat yourself to a choice of traditional beauty treatments set in your own tropical oasis at the Maya Ubud. Discover the unique Spa at Maya, descend by elevator thirty metres down the cliff face to a cluster of thatched pavilions. 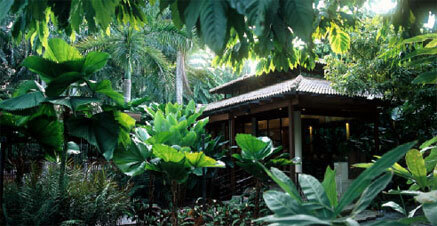 Each pavilion has its own private facilities discreetly hidden by lush foliage and cooled by ceiling fans and tropical breezes. An integral part of the overwhelming peaceful ambience is the sound of the Petanu River on which three single pavilions sit at water's edge. If you are with a partner, luxuriate, post treatment in the handcrafted stainless steel bathtub or on the day bed of the two double treatment pavilions overlook the river. Not only is Bali well known for its Art, Architecture and Gardens, it is also famous for incredible cuisine. Like the gardens we visit, Bali fuses and blends many styles together to offer some of the most eclectic dining in Southeast Asia. You will be spoiled for choices including meals prepared by some of the world’s most interesting chefs which have decided to make Bali their home. 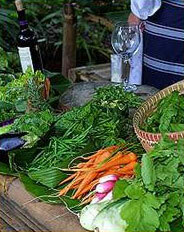 But what truly makes Bali a memorable culinary experience is the availability and variety of fresh, local ingredients (increasingly organic) grown in the island’s mountains and valleys. Even “simple” items become a new experience- homemade sauces and marinades, exotic fruits and juices, fresh market fish, ginger tea, artisan bread, handmade pasta and much more. We will also have the opportunity to experience Bali’s own unique cuisine -- complex, distinctive and practically unknown outside the home. It has no written history, with recipes passed down from mother to daughter -– or in the case of the ritual dishes which can only be prepared by men, from father to son. The same dish can vary from region to region and even from village to village. Real Balinese food is seldom found outside of religious ceremonies or the family compound, but our Tour will include an authentic Balinese feast including, smoked duck, vegetables with coconut and fern tips, traditional roasted pig and Bali’s very own style of satay.